The H5N8 strain of the avian influenza virus has been detected in a range of wild seabirds, namely; Swift, Sandwich and Common terns, as well as the endangered African penguin and Cape gannet. We ask the public to report ill and weak seabirds and dead seabird carcasses to us, so that the spread of the virus can be monitored along our coastline. We have been aware of the potential threat of this bird flu strain since the middle of 2017 when it was clear that it was spreading southward through the African continent. SANCCOB has improved the bio-security at its rehabilitation centres to reduce the chance of the disease entering facilities and affecting birds undergoing rehabilitation. At present the number of African penguins showing signs of the disease in the wild is small. Since the beginning of the year, only six penguins with bird flu have been presented to SANCCOB; a total of 15 cases have been confirmed in the Western Cape. Western Cape Veterinary Services, CapeNature, South African National Parks (SANParks), the national Department of Environmental Affairs, City of Cape Town, SANCCOB and other seabird rehabilitation centres and private veterinarians are working in close cooperation to monitor the virus and restrict the spread by humans between infected and non-infected areas. Since the African penguin is highly endangered, suspect birds are not euthanised immediately; SANCCOB has set up an isolation area to quarantine any suspected seabirds admitted from the wild until the correct tests can be run. “Unfortunately, the disease is present in wild birds and as long as infected birds interact with others it will spread. We cannot protect these wild animals by taking them all to a safe place. What we can do is reduce the chance of people spreading the disease and that is why restrictions to access colonies were put in place. 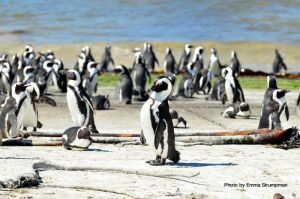 People should not interact with wild birds, including penguins – not only due to bird flu but because the disturbance causes stress to the birds,” says Roberts. The virus is spread through direct contact between healthy and infected birds, and indirectly via contact with contaminated equipment or other materials. Affected birds show neurological signs such as twitching, difficulty in breathing, and may have bright green guano. Suspected birds should be reported to the nearest seabird rehabilitation centre or state veterinarian and handled with caution to reduce the chance of spreading the disease to domestic poultry and other birds. Avian Influenza is a controlled disease and suspected cases should be reported to your local state vet. Please report any ill or injured seabird to SANCCOB (Office hours +27 21 557 6155, after hours +27 78 638 3731) or another seabird rehabilitation centre.